To celebrate Liverpool's 800th Anniversary we have designed an educational software package that brings to life the city's rich and diverse past through computer animation. The software will allow people to create short animated stories set against a backdrop of Liverpool's 800 year history. 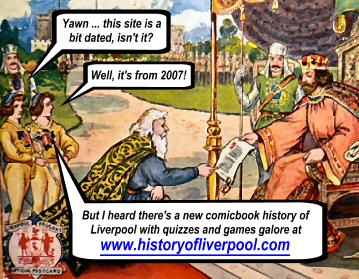 The software allows anyone to easily create animated stories using banks of purpose drawn clip-art that relate to different eras in Liverpool's history. The finished animations can be saved and emailed to anyone. The software will be ideally suited to local community organisations, youth groups, primary and secondary schools and F.E colleges. There are some supporting material and powerpoint slide-shows to educate and enlighten people about each historical era. School teachers can use it to compliment their own History, ICT or PHSE lessons. The software has been designed to help the people of Liverpool relate to their history and culture. It is both fun and educational, and brings the past into the present.